This week we participated in an excellent real world learning experience outside the classroom (and it was almost free!). My Grade5/6 class has been exploring biographies, memoirs, and looking at the features and format of recounts. We have also been using our MacBooks to support our learning in various ways. An opportunity arose to bring the two together by visiting an Apple store to learn how to create an iMovie in the form of a biography about each student. The entire trip, including transportation, came to $1.50 per student. It ended up being a meaningful, incredibly fun, and real world learning experience for everyone! This year, our division is committed to creating as many of these powerful learning opportunities as possible for our students because the enthusiasm, eagerness, and results we see back in the classroom support the belief that applying concepts and new learning to real life experiences is what creates long-term understanding. When you begin to explore all the possibilities to have students apply classroom learning and experience in a real world setting, with a little creativity and investigation, it’s amazing how many opportunities are out there! 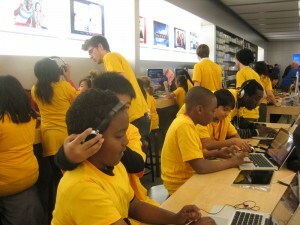 The only expense our students had was the bus trip to the Apple store for $1.50. In return they received lessons and support from a team at Apple, a free t-shirt, the opportunity to use the latest technology to create their iMovie, and a certificate of participation in the program! It can’t get better than that! Students watching their video biographies!